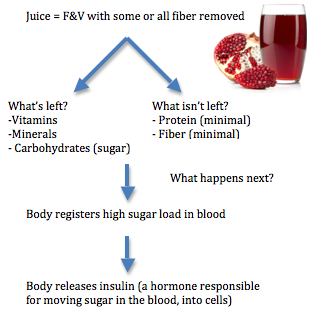 In part one of Juicing: Healthy Habit or Half-Witted Hypothesis? we discussed what juicing is and why associated cockamamie claims don't stand up in a court of science. Now, we can discuss the proverbial cousins of juicing and the juicer: The smoothie and the blender. Jump in, strap up and prepare to be pulverised. A smoothie is made in a blender from a mix of ingredients, traditionally fruit, but often includes a combination of ice, milk, yoghurt, honey, chocolate, vegetables, seeds, peanut butter, etc. 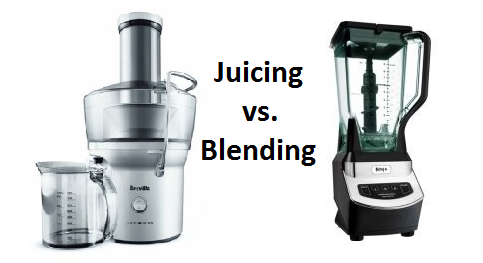 Unlike juicers, blenders do not extract the liquid (juice) from the plant tissues (fiber). Rather, blenders hold onto all the good stuff. Yep, you can tell that pretentious friend of yours who is 'juicing', that smoothies are a better choice. Because smoothies contain that wonderful fiber, it takes your body longer to digest, compared to juice. But (and there's always one), let's not forget that blender blades 'cut' and obliterate plant cell walls, liberating their contents. This means your body doesn't have to work as hard or as long to digest it compared to a whole, unpulversised fruit or vegetable. 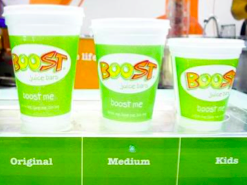 Here's a definite reason for smoothie lovers to fist bump (or flump, though that sounds a bit suggestive... But I don't mind). As we said earlier, smoothies generally incorporate one or more forms of dairy: Yoghurt and/or milk (sadly, smoothies are not really a place for cheese). But as we know, dairy is an excellent source of protein and many vitamins and minerals. 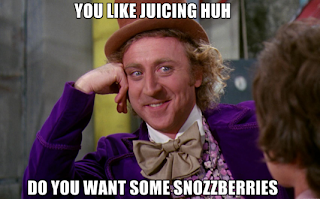 Take that, all you juice junkies. 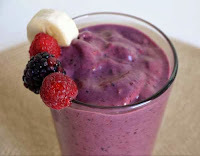 Smoothies can be ideal meal replacements because they contain fiber and dairy, thus providing a fairly balanced and nutritious option. The dark side of these creamy, blended beauties often lurks in those you find outside your home AKA: The commercial ones. As with anything made by a corporation, they are manufactured to taste as delicious as possible so you buy it again... For smoothies, this means adding plenty of sugar. The take home messages and tips? 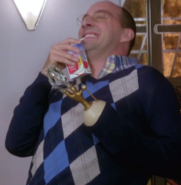 Let's talk about a fabulous (or is it?) trend that has people squawking and gobbling all over the place: Juicing. 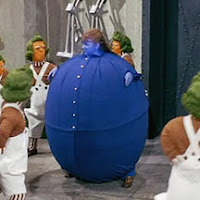 So, when I hear someone say, in a very pretentious voice: 'oh I'm juicing', I can't help but think of Violet Beauregarde from the original Willy Wonka and the Chocolate Factory... Because she was sent to the juicer... C'mon, you know what I'm talking about! Let's centrifuge out the facts, (pulp) fiction and watered down claims. Juicing is the act of extracting liquid (juice) from plant tissues using a juicer. This article discusses the act of juicing, next week's article "Juicing: Healthy Habit or Half-Witted Hypothesis? Pt II" will discuss smoothie-ing (yes, there is a difference). Juicing became popular back in the 90s, when proponents professed it could reverse everything from aging to chronic diseases. It has since evolved in our polar society where some of us are health obsessed and others are, well, the complete opposite. People and companies with their finger on the juicer button shout similar claims from their atop their soap, or in this case, juice boxes. Why it's rubbish: Our bodies evolved eating whole fruit and veg because that's what existed in nature. Your digestive system is not only equipped and designed to deal with fiber (hence why we have gut bacteria), but high fiber diets are implicated in better intestinal health and lower cancer risk. After all, caveman didn't run around with juicers. Why it's rubbish: There's no scientific evidence to support that claim. But if that isn't enough, try this: Your kidneys and liver are very capable organs that evolved to eliminate body toxins. Theory: Not sure, perhaps an extrapolation of the fact that fruit and veg are low in calories, therefore drinking them help with weight loss? How many oranges does it take to make 1 cup of OJ? Would you sit and eat 4 oranges in one sitting? Piggybacking on that thought, if you were to eat 4 oranges at once, would you stay fuller for longer compared with drinking 1 cup of OJ? Juice can be a useful way to increase your nutrient intake, but remember you're discarding the skin and fiber which are loaded with antioxidants and other goodies important for digestive health. Juice is fine every now and then, but come on... Put a real meal in your pie hole. 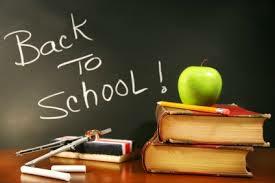 Back to school is here! Sending pint-sized pie holes to school with a healthy lunch is important for their health, eating habits, brain function... Yada yada yada. We all know why it's important. Let's discuss some ways to get kids not only eating their lunch, but also excited about their lunch. 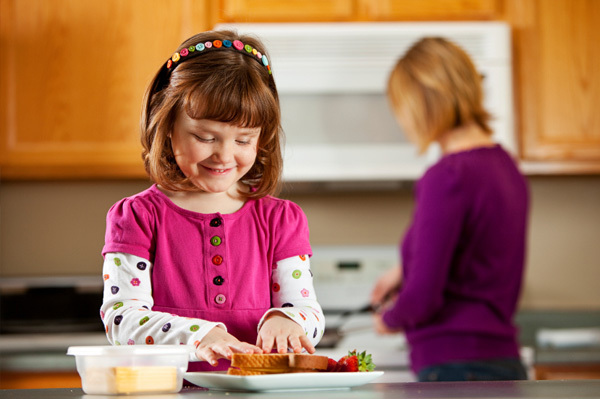 When kids are young, often they are happy with the same, or similar foods on a daily basis. But as kids get older, their palates develop and their food repertoire increases. 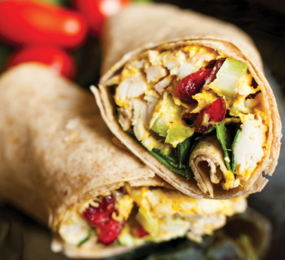 A starting point is finding out what your kids want for lunch. Of course, there are boundaries: 3 hot dogs, an ice cream sundae and a spit roast don't really fall into the 'healthy' category. But seriously, getting kids involved in their lunch choices and lunch preparation is a sure-fire way to increase the likelihood of them eating it - as a side note, it's also a 'teachable moment', where parents can explain and show how to pack a balanced lunch (a life skill). Roasted veggies (from last night): A mix of capsicum, zucchini, eggplant (or whatever veggies they like) sliced, thrown on a baking sheet, brushed lightly with olive oil and spices - voila! 'Sometimes foods' like the individually wrapped bags of chips, a homemade cookie or muffin are definitely acceptable a couple of times a week. In many ways, this is also a 'teachable moment' because you're demonstrating healthy moderation and portion control, rather than imposing impossible restrictions. 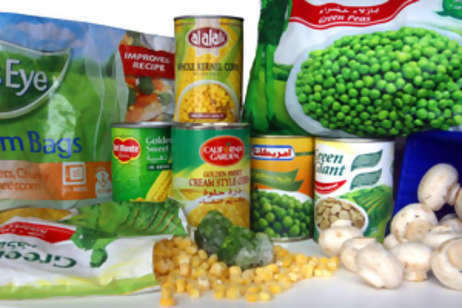 Healthy and Affordable: An Oxymoron? 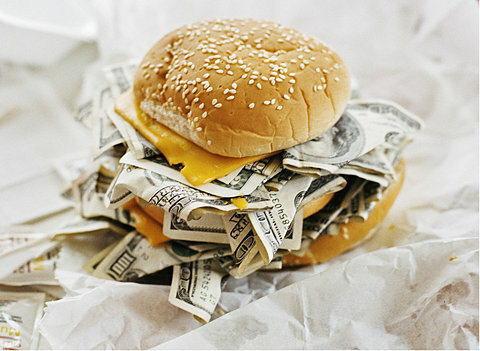 When the media reports that fast food is cheaper than healthy food, they are comparing the calories you get per dollar. 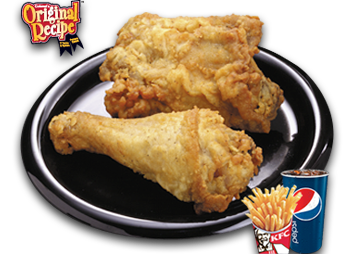 With that knowledge, I pose this question: Will a combo meal of fried chicken, wedges and a 20 oz (600ml) Pepsi have more calories than a homemade chicken salad sandwich, an apple and glass of water? This question of course, or at least, I hope, is rhetorical. The goal is, eat enough food to keep our bodies healthy and working optimally, not put in as many calories as we possibly can. Otherwise, why not chow down on a bucket of lard, cram some non-dairy creamer, or better yet, chug some clarified butter? A recent study set out to identify which vegetables provide the most nutrients per unit cost. 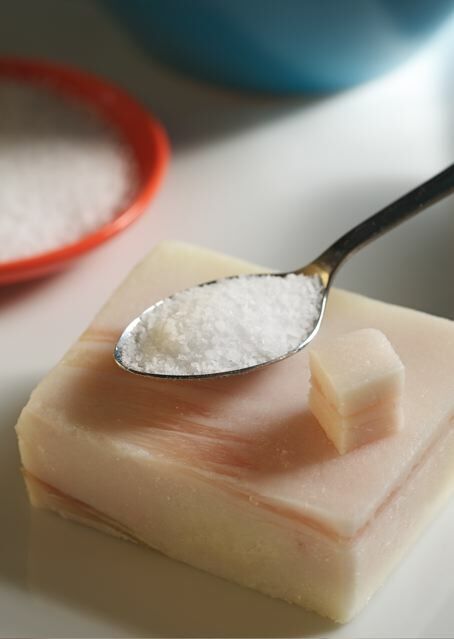 This was based on 9 beneficial nutrients (protein, fiber, vitamins A, C, E, calcium, iron, magnesium and potassium) and 3 nutrients to limit (saturated fat, added sugar and sodium). 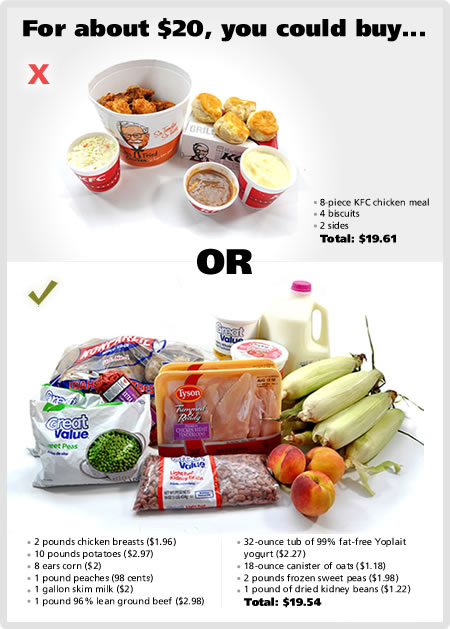 A little different than comparing foods based on their calorie content, right? 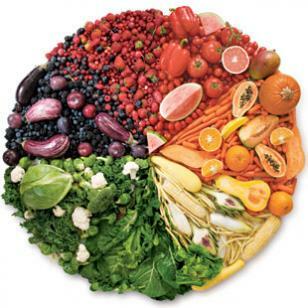 Most vegetables are low in calories and high in nutrients, precisely the opposite of fast food. All this costs about $US5. You'd have to put 2.9kg (6lbs) of spinach or 1.7kg (3.8lbs) of pumpkin in your pie hole to get that many calories... Now that would cost more than $5.